For years, my family loved to go and pick organic strawberries each summer. We’d pick enough strawberries to make jam, fruit gummies, and fruit leather, plus have tons to eat. That all stopped in 2014 (when this picture was taken), after I learned that organic strawberries weren’t so organic. For the last 2 years, we haven’t eaten nearly as many strawberries as before and, every time we ate them, I wondered just how bad they really were. According to the CA Strawberry Commission, California is the leading strawberry producer in the U.S. with approximately 90% of the market and 2.3 billion pounds ($2.6 billion dollars) of strawberries harvested in 2014. Conventional strawberries bore an average of 5.75 different pesticides per sample, as compared to an average of 1.74 pesticides per sample for all other produce. This has caused the Environmental Working Group (EWG), to issue this statement on why they elevated strawberries to the top of their Dirty Dozen list. Though organic strawberries do not utilize all of the pesticides that conventional strawberries use, almost all organic strawberries start as conventional starter plants. Federal code allows organic farmers to use strawberry starters grown in fumigated soil if there are no organic starters commercially available. In CA, there aren’t any organic commercially available starters and conventional strawberry starters are fumigated with methyl bromide. This was not always the case, but in this article they explain how organic strawberry farmers have been able to continue labeling their strawberries as organic, even though methyl bromide is used on all their plants. Methyl Bromide is used as a soil fumigant to control nematodes, insects, and weeds and has been used extensively since 1967 for strawberries to control soil-borne diseases. It is an odorless, colorless gas and dissipates rapidly to the atmosphere. It is most toxic to farm workers because they breath in the gas, causing central nervous system and respiratory system issues and can cause harm to lungs, eyes, and skin. It also depletes the ozone layer, which is why methyl bromide use is currently banned, except for emergency or critical use, per the Montreal Protocol. The National Pesticide Information Center (NPIC) methyl bromide fact sheet and the Environmental Protection Agency (EPA) Hazard Summary go into extensive details on all the concerns regarding methyl bromide and it’s hazards. Since 2005, California strawberry growers have been granted exemption from the Montreal Protocol based on the critical use clause, which states that the lack of methyl bromide availability would result in significant market disruption and that no technically or economical feasible alternatives or substitutes are available. This exemption, though authorized by the EPA, is permitted through the authority of the Clean Air Act and the Montreal Protocol Twenty-Sixth Meeting of the Parties in November 2014. The good news is that strawberry growers will not be permitted to utilize methyl bromide after 2016. But there’s still this summer’s strawberry season and, though I could find no information that the EPA and the US is requesting another extension to continue using methyl bromide – what happens if it is still used next year? I started researching to see how much methyl bromide is really in the organic strawberries we eat. It was not easy to find studies that let me see just how much methyl bromide is actually is in strawberries. I finally found a 1979 study that measured the amount of methyl bromide in several crops (the only study I could find). Strawberry leaf, fruit samples, and soil samples were collected from control and fumigated fields representing 1 to 6 annual fumigations, from 6 different California counties. Results showed that strawberries had less methyl bromide in them versus other crops and that the highest concentration was in the first year. The conclusion of the study was that strawberry plants that were fumigated prior to planting is low, due to the fact that it is not able to absorb methyl bromide from the soil and that the fruit itself is even lower in methyl bromide than the leaves. Though the study is old, it did fill me with more confidence that the toxicity in organic strawberries was not as high as I believed. There is also hope for the strawberry industry as a whole. 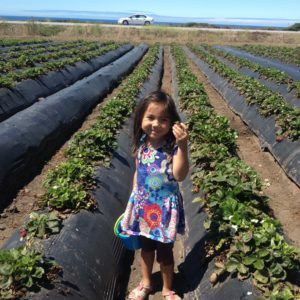 Our favorite U-Pick organic strawberry farm is Swanton Berry Farm, the oldest organic strawberry farm in CA, but like all others, they use conventional starters. For years, owner Jim Cochran, with other organic farmers, has been trying to change regulations and rulings on the use of methyl bromide. The Center for Food Safety (CFS) issued a statement and has been working since 2011 on alternatives to methyl bromide use. In 2014, they successfully conducted field trials using organic starter plants. Driscoll, one of the largest organic strawberry producers, announced that they have developed and maintain the only organic strawberry nursery certified by the CCOF, the oldest and largest 3rd party certifying agency. Currently, 10% of their organic strawberries are grown from their starters, but that they hope to have that number increase. These successes can only mean organic strawberries will soon be truly organic and better for our health and environment.